Long-term changes of structure and tree species composition in Dinaric uneven-aged forests: are red deer an important factor? 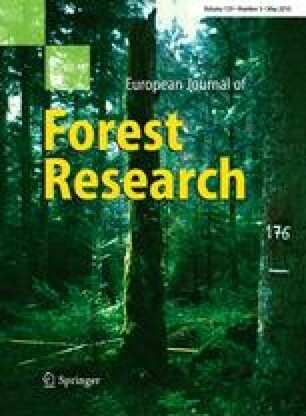 Uneven-aged silver fir-European beech forest stands were studied to (1) analyse the dynamics of diameter structure and tree species composition in the past two centuries and (2) determine the impact of red deer on the regeneration and recruitment of silver fir. The study used current data on forest stands, archival data from old forest management plans for the period 1789–2004, and red deer harvesting records for the period 1907–2006. During the observation period, the silver fir population aged and silver fir and European beech alternated in dominance. The study revealed a strong impact of red deer on the composition and recruitment of tree regeneration, especially on silver fir regeneration. The drastic changes in red deer density (from extermination up to 5.8 animals km−2) and past forest management practices were apparently the main factors driving the population dynamics of silver fir (regeneration, recruitment, and diameter structure) in the study area during the past two centuries.